English Description : Employee spy software is an excellent tool to monitor activities of your employees at work place or your children, spouse at your home. You can easily know how your employees perform and use the resources provided to them. 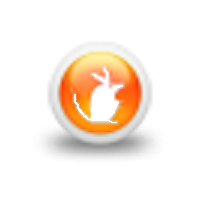 Employee spy software lets you know every move of your employee and gather evidence for any mis-conduct. Acting like a key logger, it displays and records every keystroke typed by the user; even the function or modifier keys like Alt, Ctrl, Space, Enter, Shift etc. Like a supervisor it captures and displays every screenshot of the monitored computer. What if you are not present to monitor activities; Employee spy software helps you in this too by creating offline logs for every user. 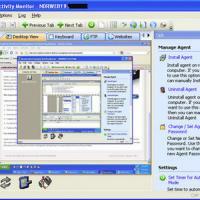 An invisible monitoring tool lets you secretly spy activities without letting the user know about it. 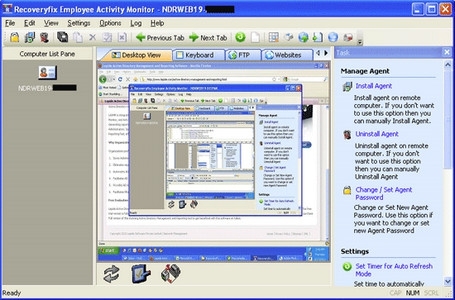 invisible monitoring, logs keystrokes, capture screenshots, view visited websites with their time duration, with view window processes, view FTP activities, have complete control over monitored PC by locking it, closing and restarting it, execute commands from your PC to monitored PC for execution or termination of any program launch or close.